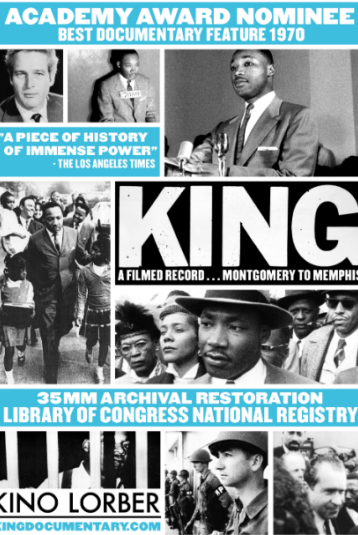 King: A Filmed Record...from Montgomery to Memphis is the landmark documentary that chronicles the life and work of Dr. Martin Luther King, Jr., from the beginnings of the Civil Rights movement in Montgomery, Alabama, and culminating with his assassination in Memphis in 1968. Originally screened in theaters for only a single night in 1970, King: A Filmed Record combines dramatic readings by Harry Belafonte, James Earl Jones and Paul Newman, among others, with newsreel and archival footage to create a powerful and comprehensive record of Dr. King's legacy and the American Civil Rights movement. King: A Filmed Record is an indispensable primary resource of a pivotal moment in American and world history.